Welcome to the St. Augustine Catholic parish website. Based in Milwaukee County and served by priests of the Croatian Franciscan Custody headquartered in Chicago, our family-oriented West Allis church continually strives to serve the will of God through deepening the baptismal gifts of faith, hope and love. We believe in enriching our parish through the sacraments, especially the Eucharist, as well as through sacred scriptures and the traditions of the Catholic Church. St. Augustine ministers to the spiritual needs of our local community and reaches out to those who wish to deepen their relationship with God. The parish was founded by Croatian immigrants and continues to serve the needs of the Croatians in the West Allis Area. We welcome Catholics of all ages and backgrounds, as well as those interested in Catholicism. 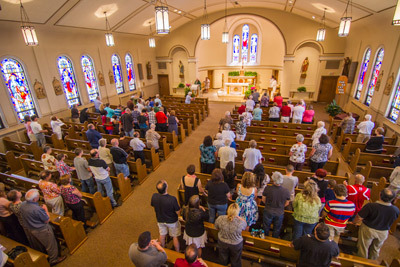 With multiple mass times, West Allis Catholic Church devotees may gather together to praise the Lord through devotional worship, prayer and quiet reflection. During our Catholic mass, we strive to renew our faith, strengthen God’s love within and deepen our love for one another. We believe in spreading God’s love by building long-lasting relationships within our congregation. St. Augustine enhances these relationships by putting on some of the most entertaining church festivals. Our church is dedicated to serving and enriching our community by spreading the Word of the Lord, sharing in God’s love and creating a sense of community within our parish. Take a peek at some of snapshots taken at our church in West Allis to see why so many choose St. Augustine as their preferred parish. If you are searching for local churches in West Allis, WI, we hope you will find your new spiritual home within the congregation of St. Augustine. Our Catholic Church in West Allis welcomes new members every month. Friendly, genuine and always willing to serve the needs of others, our congregation makes you feel like an integral part of our tight knit parish. Come experience St. Augustine this week and you’ll understand why we are revered as one of the fine Catholic churches in West Allis. Look below for our Saturday and Sunday mass schedule. We look forward to seeing you there! When you need to find a Catholic Church which is friendly and committed to serving the Lord, St. Augustine is the church for you! Traditional religious services and engaging social activities make St. Augustine a most welcoming church. Visit St. Augustine this week and experience all we have to offer. Contact our West Allis church today to learn more about our values, mission and community involvement.